Thrilling racing, no brakes and acceleration to rival a Formula 1 car. 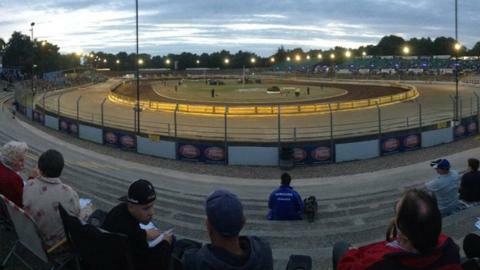 Speedway, which involves single-gear bikes negotiating an oval circuit in an anti-clockwise direction, is what one rider at an Ipswich Witches meeting describes as "motorsport at its rawest". So why is the sport "fighting a losing battle"? Domestic speedway attendances in the United Kingdom are not what they once were. While Cardiff recently attracted 40,000 to the 2015 British Speedway Grand Prix, fan numbers have fallen within domestic speedway. Ipswich ride in the Premier League, the second tier of British speedway, and while attendances at Foxhall Stadium reportedly reached 20,000 in 1950, the Witches raced in front of what looked to be more like 1,000 people as they took on second-placed Glasgow Tigers last month. In the empty stadium a few hours before the general public would arrive, it became immediately obvious how accessible the riders are. Ipswich rider Gino Manzares was in the paddock, and it did not take him long to show his frustration at the state of the sport. "It's basically a four-lap drag race," he said. "It's faster than a Formula 1 car off the start, going from nought to 60 mph in 2.3 seconds, so I don't see why we don't get more people in. It's a dying sport that we're trying to bring back. "We are fighting a losing battle. Some people come once and think it's boring, but that's just one meeting. Come the next week and we're nearly taking each other's heads off!" Manzares was convincing when he spoke about the entertainment factor. Ipswich captain Danny King was no less passionate. "It gets hot, it's close racing, and you're on the edge of your seat for the whole night," said the 28-year-old. "It's a good place to come with your friends and you get to watch 15 heats of quality racing." But even he could not ignore the decline in attendance: "The crowds just aren't there like they used to be. The way the economy is at the minute, people can't afford it." Attendances at Ipswich are certainly not what they were 65 years ago, but what of the fans who do attend? As they arrived, I posed the question to the people who pay the admission fee. "It's 10 times better than football," said one fan. "We've come to see some good racing. "It's 100% friendly as well. We're all different age groups and everybody mixes well." Another fan, Nigel Fordham, has attended more than 5,000 race meetings since 1969. Although he clearly loves the sport, he echoed King's thoughts on fans' financial constraints. "I love speedway, but it used to be a lot more popular. It's too expensive now," he said. "This is a £10 sport. It should be £10 for adults and free for kids." John Louis is perhaps the best man to ask. The former Ipswich rider and promoter won the Speedway World Team Cup for both Great Britain and England in the 1970s, and believes the quality of speedway in the UK is not what it used to be. "We used to have Test matches against other countries, and 90% of the time we would win," he said. "The level of the racing has gone down in England a bit. The Danes and the Swedes are better. Here at the football we get massive crowds, but if you go to Poland it's the other way around." And it is perhaps this standard which attracts the world's finest riders. Britain's Tai Woffinden, who leads the Speedway Grand Prix World Championship, rides in Poland's popular 'Ekstraliga', having dropped out of Britain's Elite League in order to pursue the title of world champion once more. At the end of a night of close racing, Glasgow Tigers won 47-43. The result will have frustrated Ipswich, but the entertainment factor, as Manzares suggested, was unquestionable. The East of England is host to a number of speedway teams. Peterborough Panthers have pedigree at the top level, having won the Elite League in 2006, but even they were not immune to financial difficulty. In November 2013, the club was put up for sale, whereupon former owner Mick Horton took on a two-year lease. Horton left the club after one season, but the Panthers were saved by north-east businessman Ged Rathbone and co-promoter Trevor Swales. The duo managed to raise the £40,000 target required on the last day of an extension offered by the British Speedway Promoters Association. And, with the 2015 Premier League speedway season in full swing, the Panthers are enjoying success both on the track and in the stands. "We've connected massively with the supporters this year, and that goes with this season's attendances, which are up," said Rathbone. "I think fan-wise we're one of the better clubs. "Speedway has to reunite with supporters - money is short out there and we have to give them a product that is value for money." However, Rathbone also highlighted the need for improved promotion, saying: "I don't see advertising for speedway. There should be a nationwide advertising campaign. Speedway has to pull together and work as a unit so we can attract people to the sport." Rathbone's comments highlight the many challenges that face Peterborough, Ipswich and a number of other domestic speedway clubs. But, while the priority is to attract new fans to the sport, those already smitten must not be forgotten about.